New Joke Book: A Real Jokefest! A few posts ago, on April 13, I talked about mistakes in the publishing business and then went off on one of my silly mind warps :-}. It all started when I saw my name listed online as a co-author of a joke book of which I’d never heard. Well, as it turns out, I was the one who was mistaken. 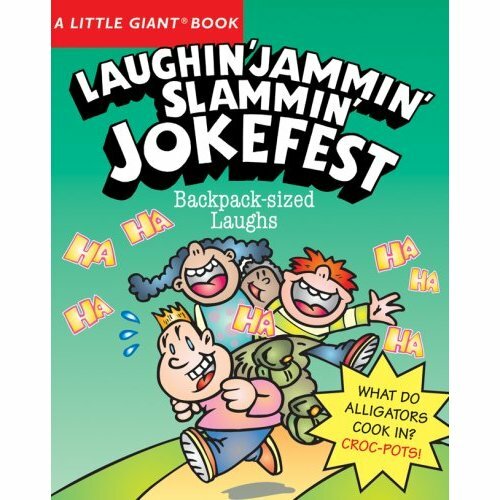 The book, A Little Giant Book: Laughin’ Jammin’ Slammin’ Jokefest (A Little Giant Book), co-authored with Jacqueline Horsfall, is a joke collection of jokes and riddles from previously published books by Sterling Publishing Co., the same company who has published my other three joke books (I guess they just forgot to inform me about this new collection). So, to this little author’s delight, I’ll have a fourth joke book coming out in August of 2007. Wow! Talk about a gift! A new book and I didn’t even have to write any new material for it (maybe this will make up for all those rejection letters and other frustrations that come with this business…hmm…nah! Not even close!). So, keep those eyes peeled (and potatoes and bananas) in August, for the next collection of humor, ala Terry (and Jacqueline).